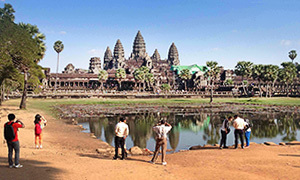 I spent Christmas and the New Year in Siem Reap, Cambodia, visiting the extraordinary collections of Hindu and Buddhist temples around the Angkor – the crown jewel being Angkor Wat. Built at the time of Notre Dame de Paris – late 12th and early 13th centuries, it dwarfs its Parisian counterpart, and furthermore is set within a huge moat. It is truly one of the wonders of the world. But this is not a travelogue. My trip from London to Cambodia via Seoul and, on my return journey via Hong Kong to visit Naxos HQ, involved a lot of travelling. And this is where audiobooks prove to be marvellous companions – in some unexpected ways. Many airlines offer audiobooks as an enriching alternative to the diet of popular films and music. If you travel on Korean Air between January and April, for example, you can divert yourself with the great poems of Keats, Shelley and many others courtesy of our Popular Poetry, Popular Verse; or learn about Descartes in an absorbing introduction read by Jonathan Oliver; and your children can encounter Great Explorers of the World, which even they might welcome as a change from the film programme. If you find yourself on Eva Air, on the other hand, the offerings include Dickens’ Sketches by Boz read by David Timson and The Life and Works of Liszt read by Jeremy Siepmann and containing many musical excerpts. Of course, this is all happenstance; and for many, listening on a plane this way may be the first introduction to the glories of the audiobook medium. Regular listeners (and I am one!) prepare for such a long journey carefully by selecting a few audiobooks (crime, non-fiction, comedy, drama) and putting their choices on their smart phone for access at any time. This is a real boon, because one can be informed and entertained seamlessly through the laborious airport process, from getting there, to waiting in the checking-in queue etc (though I suggest the earphones come out at passport control. The officials don’t like it!) Another hiatus is the 15–30 minutes while the plane gets airborne and lands, when all devices have to be shut off. But for the rest of the time, you can enjoy your personal choice. What did I listen to? Well, from Naxos AudioBooks it was mostly programmes we are releasing this year. There are many hours of new recordings coming up – including Fielding’s neglected Barry Lyndon read by Jonathan Keeble, released this month; The Prelude, Wordsworth’s autobiographical poem presented sensitively by Nicholas Farrell, due in June; and the great Finnish folklore classic, The Kalevala, read by its translator, Keith Bosley – which comes out in February. But I also wanted some lighter fare and by other publishers I must confess to being gripped by John Grisham’s The Racketeer and absorbed by Alan Arkin’s idiosyncratic audiobiography An Improvised Life. I enjoyed his performances in Little Miss Sunshine and Argo so much, I wanted to know more about him. During some 40 hours (or however much it was) of travelling, I didn’t watch one film. And I must mention one surprise. On New Year’s Eve I found myself at a hotel party in Siem Reap with some 200 guests from all over the world. I was seated next to a couple and we began talking. He was English by birth but had lived in Australia for many years. He was an astute, well-travelled retired businessman, and our conversation wandered over many topics. He asked me what I did. “I am a publisher,’ I said. ‘Audiobooks.’ I say this not necessarily expecting a positive response because it is still a niche area of the book world. I think he said tremendous, because as the conversation flowed, so did the wine, and I was slightly in my cups when I left the table. But it was something approving. How much more gratifying could it be than to go to a New Year’s Eve party in the Cambodian countryside and meet an Australian who listens to the hours of Charles Dickens on Naxos AudioBooks! I hope this augurs well for 2013.